Geneva students volunteered all weekend at the Dragon Boat Festival. For their Webster Works Worldwide project this year, 32 undergraduate student leaders and study abroad students at Webster University's Geneva campus volunteered to help the English Speaking Cancer Association (ESCA) Dragon Boat Festival, the ESCA's major fundraising event. 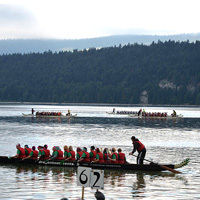 The festival of dragon boats and racing in the small Swiss village of L'Abbaye was attended by about 3,000 people, including the Webster student volunteers who helped with logistics while forming new bonds with each other and their community. The festival organizers appreciated the support from Webster students, dressed in their purple Webster Works Worldwide 2015 t-shirts, who have volunteered with the organization for the past seven years. See more photos and quotes from students in the full story at Webster Geneva. Webster Works Worldwide is Webster University's annual, global campus-wide community service day, where community members at each campus worldwide partner with local agencies and nonprofit organizations. Students, faculty, staff and alumni work in teams on projects including tutoring, painting, gardening, working with children or seniors, park and trail restoration, and fine arts projects. Since the start of Webster Works Worldwide in 1995, more than 30,000 volunteers have given more than 128,000 hours of service. No matter how Webster University volunteers choose to donate their time, they make a difference in their communities and help those in need.